Line a large baking sheet with parchment paper. Place white chocolate chips in a large microwave-safe bowl. Microwave uncovered for 2-3 minutes. Stir, and continue heating in short intervals until chocolate is smooth and glossy when you stir it. 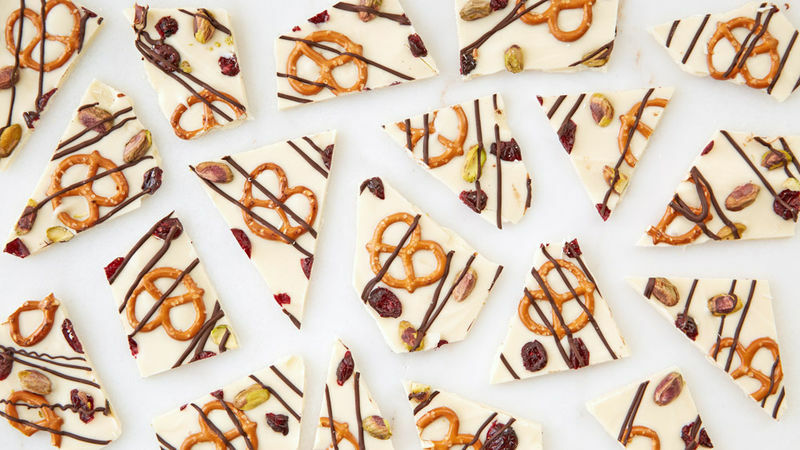 Immediately place mini pretzels over the surface of the chocolate, then sprinkle with dried cranberries and shelled pistachios. In a small microwaveable bowl, microwave the dark chocolate chips uncovered on high for 1-2 minutes until almost melted. Stir until smooth and drizzle on bark. Place melted dark chocolate in a sandwich- or 1 quart-size plastic food storage bag. Seal the top and cut a small tip off one of the corners. Use like an icing bag to drizzle dark chocolate over the bark.